Me: "Hi, Mom. Could I have your recipe for blueberry muffins?" Mom: "Oh, sure, honey." (Sounds of papers shuffling.) "Here it is -- my recipe for Jordan Marsh Blueberry Muffins." Me: "Nooooo. I want your recipe for blueberry muffins." Mom: "Honey, this is my recipe. It's the one from Jordan Marsh. I have been using it for as long as I can remember." Me: "You mean all these years that I thought I was eating your blueberry muffins, I was actually eating Jordan Marsh's muffins?" Mom: "I'm afraid so, honey. Do you still want it?" Me: "Well, of course I still want it. But I won't call them Jordan Marsh blueberry muffins. I'll call them My Mom's Jordan Marsh blueberry muffins." I gotta tell ya, it wasn't easy discovering my mom's blueberry muffins were actually Jordan Marsh's, the now defunct, but once hugely popular department store. I remember shopping at Jordan Marsh with my mom when I was a kid; it was the place where we bought shoes and handbags and kitchen appliances, but not blueberry muffins. That's because they didn't sell them in Rhode Island. For the beloved Jordan Marsh blueberry muffin -- a moist, cakey, berry-studded delight with an irresistible crunchy sugar topping -- you had to go to Massachusetts. 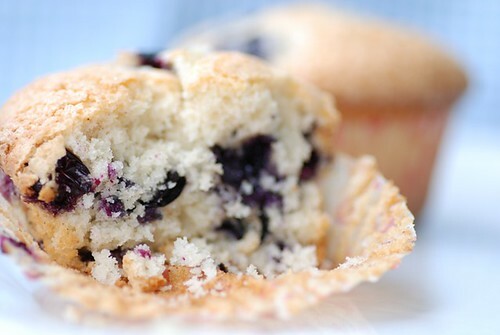 The iconic Jordan Marsh blueberry muffin was created by baker John Pupek in 1961. Pupek took pride in his muffins, folding in the blueberries by hand and overseeing the baking of each batch. Apparently his muffins were so delicious that they transformed disagreeable children into angels. After Jordan Marsh closed in 1990, Pupek opened his own bake shop where he sold the cherished Jordan Marsh blueberry muffins as well as other sweets made famous by the store. Much to the dismay of his loyal customers, Pupek closed shop in 2004. Physically worn out, the baker needed a rest. Upon his retirement, Pupek swore to never sell the Jordan Marsh muffin name. He told the Boston Globe, ''if people said they had a Jordan Marsh muffin and it was horrible, it would kill me." Fortunately the treasured Jordan Marsh blueberry muffin recipe is available online and in some cookbooks, such as Nick Malgieri's How to Bake. 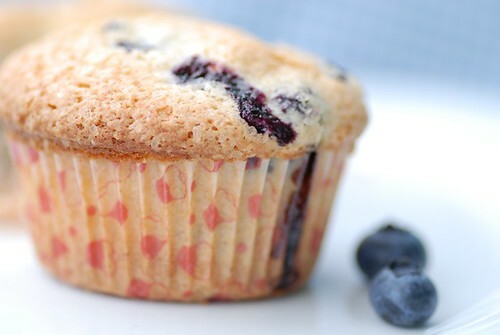 Since we're in prime blueberry season, now is the perfect time to make a batch (or two) of these blueberry muffins. Just don't be surprised if after making them, you suddenly have a urge to toss your old blueberry muffin recipe, or to go shopping for a new pair of shoes. Place rack in center of oven and preheat to 375 degrees F. Line a 12-mold regular size muffin pan with paper muffins cups. Using a hand mixer, cream butter, sugar, and salt until soft. Add eggs, and mix until light and fluffy. Mix the flour and baking powder together, and stir into the batter, alternating with the milk. Stir in the vanilla. Mix until just incorporated. This is my mom's tip, and it works beautifully: In a small bowl, sprinkle blueberries with 1 teaspoon each sugar and cinnamon. Gently toss until well coated. Fold into the batter. Spoon batter into the 12 muffin cups. Bake for 25-30 minutes, or until the tops are light gold and a cake tester inserted into the center of a muffin comes out clean. Transfer the pan to a rack to cool for 5 minutes before removing each muffin and placing on a wire rack to cool. I adore blueberries and am always on the lookout for new to me recipes. Thanks for sharing this Susan! Great pics! They look irresistible. I remember JM too. We always went back to school shoping there. The muffins look great. I don't know anything about Jordan Marsh, but those muffins sound good to me. It is nice thought that all your family recipes have been handed down for generations but the reality is often different in my experience - but it sounds like these jordan marsh muffins have truly become part of your family history - and hope you will be enjoying them for some time to come! wanm-We wished that store too! lisa-I'm so glad it's new to you because it's a winner. lisa-Ah, yes. So did we. helene-Please do! You'll love it. johanna-I know I'll be doing my part by making them and passing the recipe on to my nieces. I was wondering what was up with the weird recipe title. It probably doesn't help that I have no idea who Jordan Marsh is. Great story! They do look like they could turn ornery kids into angels! A classic, which can't be forgotten! I just can't get enough blueberries right now. These look great, even if I did *just* make blueberry muffins! I can't resist a blueberry muffin. Just in time for blueberry fest! Oh that's funny. I think it was my grandma's 7 layer bars that were actually from the back of the can of condensed milk. ha! I give your mom (and Jordan Marsh) props! I am making these for our upcoming Sunday brunch. This is so funny - I just made Jordan Marsh muffins last weekend! My mom and I had been talking about them and she gave me the recipe she cut out of the Providence Journal ages ago. She used to take me to JM when I was little to get these muffins! They're the best!!! My Mom's recipe is also the Jordan Marsh blueberry muffins! What a great trip down memory lane. Your muffin picture was so perfect and the narration was even more tempting...I had to make it and as i am typing this..we are having the very tasty, moist and dangerously addictive muffins we 've ever tasted. I never heard of Jordan Marsh till now, but I have to say all the recipes of your Mum's you have posted here look like winners. Those muffins in the pictures look gorgeous. Just the name... "Blueberry Muffins"... This can make my mouth open wide!!! :)))) I love the photos btw. jude-I'm glad you liked it! dhanggit-Yay! I'm so happy to hear that! elly-You can never have too many blueberry muffins. michelle-My mom makes those too! But she calls them Hello Dollies. deborah-She'll be delighted to hear that. Please let me know how they turn out. addie-They are the best! My mom probably cut hers out of the Providence Journal too! caitlin-It's a fun trip, isn't it? mishmash-That is the most thoughtful comment. Thank you so much, my dear! My mom is going to be tickled when she reads it. aparna-This one's a winner too. I promise. Usually, when I phone my mother she has no clue where the recipe came from so it's super easy to give credit to her. Your mom might be a bit more organized. Regardless, these make my mouth water! I'm off the muffins at present, however. Gotta fit into a wedding gown! Your post today inspired two different kinds of nostalgia in me. The first was for the blueberry muffins and pancakes my grandfather used to make. I have his recipes, but he always shoots from the hip in the kitchen, so mine are never the same. The second was for shopping with my grandmother at the department store that was Levy's, then Maas Brothers, then Jordan Marsh in Savannah that was torn down when Jordan Marsh closed. I loved the fluorescent lighting there and all the little soaps in the bath department. I need to eat these muffins and reflect. Fantastic looking muffins. Blueberry is my sons favorite I think I will surprise him with your recipe. Yum, remember Jordan Marsh also. How would these bake up as mini muffins? Hands down the best blueberry muffins ever! I'm so glad I found this! I have such fond memories of going to Jordan Marsh with my mom when I was a kid. I grew up in Boston and live in the Midwest now, so this evoked sweet memories for me. Now I've got to bake some muffins before fresh blueberries are all gone! Thanks. Fran-Thanks for the *colorful* insight! I hadn't heard of that before. You're so lucky to have grown up in Boston and enjoyed them for so long. Susan, I've enjoyed browsing through your recipes. Looks like we have the Italian thing in common! I've bookmarked your Nan's lentil soup. It's a bit different from my mom's which I've only recently posted myself. We Italians really love our legumes!